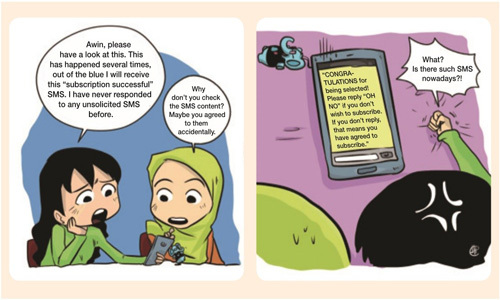 Have you received unsolicited SMS before? Odds are, you have, whether you know it or not. Unsolicited SMS comes in many forms. Scam, promotional SMS, unsubscribed SMS, and spam peer to peer are some of the types of unsolicited SMS that are sometimes used by crooks to target uninformed victims. The key to avoid being a victim is awareness and education. Therefore, you should never, ever go into suspicious or unsecured websites without proper protection i.e. anti-virus. Be safe by never randomly clicking on any pop-up advertisements or banners that you come across while going online. Nevertheless, there have been many reported cases of unsolicited SMS, as shown in the statistics below. This shows that there are still many victims out there, so do your bit and help to spread awareness about the issue to your family and friends. * The total number of complaints received by CFM in 2015 and 2016. Unsolicited/unsubscribed SMS is a major complaint category, reflecting the seriousness of the issue. Each complaint will be reviewed on a case-to-case basis. A thorough background check on the subscriber’s usage history will be done to determine if the case has any merit. If the investigation rules in the favour of the complainant, the service provider will begin remedial process, and the first step would be cancelling the SMS subscription and then crediting the charges incurred back into the complainant’s account. Do you care for a repeat of the same problem? Then please take the risk and danger of unsolicited SMS seriously.